The photo essay that follows features primarily my own photographs, documenting my personal links to Liverpool – my time at school on Menlove Avenue, in the Liverpool suburb of Woolton, and how that experience intersects with the lives of John Lennon, Paul McCartney, and The Beatles. I share with you here some of the Beatles-related photographs I’ve taken over the years in Liverpool. And I try to give you some interesting context for each picture. There are four different time periods pictured here, with four different cameras. Analog photographs and digital pictures. In the summer of 1968, the boarding school I was attending moved its location from a tiny village in rural Shropshire (near market Drayton) to the teeming city of Liverpool. What a culture shock that was. From the quiet seclusion of one of England’s most agricultural counties, we moved to the bustling, urban sprawl of a large city in the north-west industrial county of Lancashire! The new location of my school – which changed its name in the process from St. Edward’s College to Woolton College – was now on Menlove Avenue, an attractive, suburban boulevard in south-east Liverpool. We moved from a school housed in a huge, red-brick, three-storey, country mansion built in the late-nineteenth century to a cheaply-designed and pre-fab styled building – a typical piece of ugly 60s architecture. The new college was erected on a piece of property that also contained The Gables – another Victorian mansion which housed the prep school run by the same Catholic order of teaching brothers that had just opened Woolton College. Woolton College was going to be a grammar school with a mixed roster of boys – boarders from all over England (there were several of us, for example, who came from Southampton, on the south coast) and day-students, who had come through St. Joseph’s – the prep school next door. 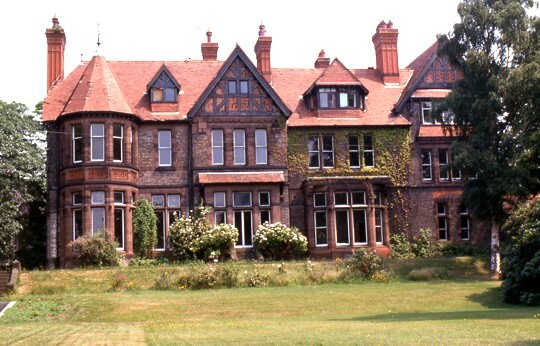 For us – the boarders who had finished their previous school year (1967-1968) in the idyllic surroundings of Cheswardine village in Shropshire, and were beginning the next year in Liverpool – the changes in setting and life-style would be abrupt and, for some of us, quite profound. The innovations in the Church which Vatican II had wrought had been slowly manifesting themselves in the liturgy and policies of all Catholic institutions. But the secluded setting in Shropshire had artificially cocooned us from the rampant secularism of the modern world. 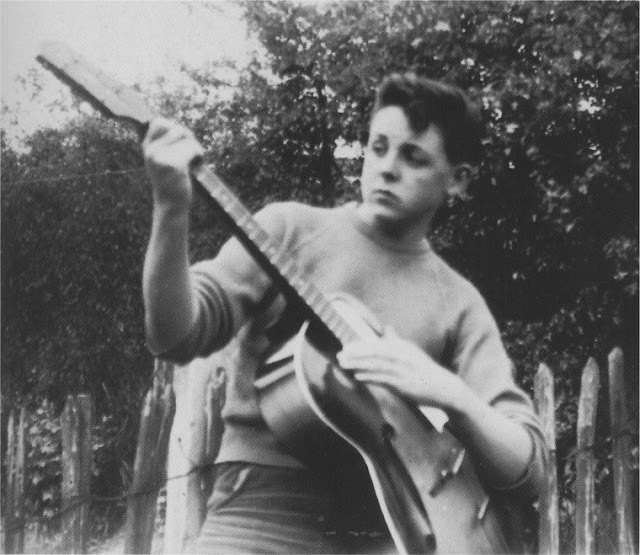 In September of 1968 I was starting Fifth Form on Menlove Avenue, in the suburbs of Liverpool – the home of my favourite pop band, The Beatles. What changes the next five months would bring!
" ... Penny Lane is in my ears and in my eyes; there beneath the blue suburban skies ..."
I quickly discovered Penny Lane. 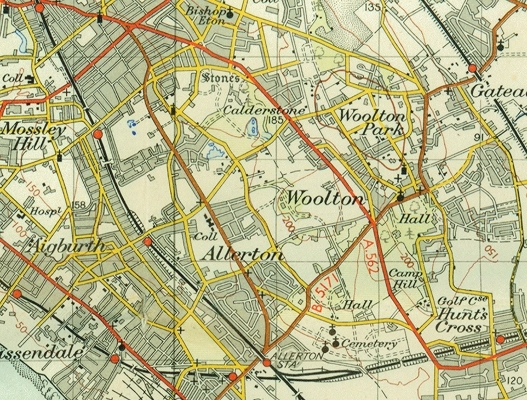 Our college, near Calderstones Park, was in an area of the city called Woolton. 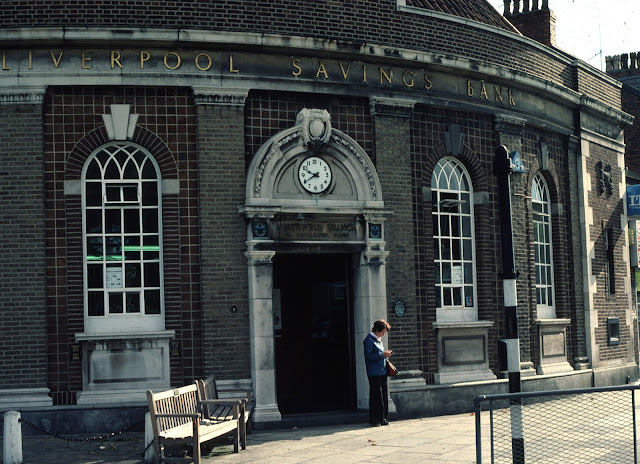 A half-hour walk north-west along Menlove Avenue would bring you to Penny Lane – which is the name not only of a half-mile stretch of road near the border between the districts of Allerton and Wavertree, but also a small shopping area, where several commercial arteries meet. Menlove Avenue turns into Allerton Road and, just after Allerton Road becomes Smithdown Road, you’re at the Penny Lane roundabout. 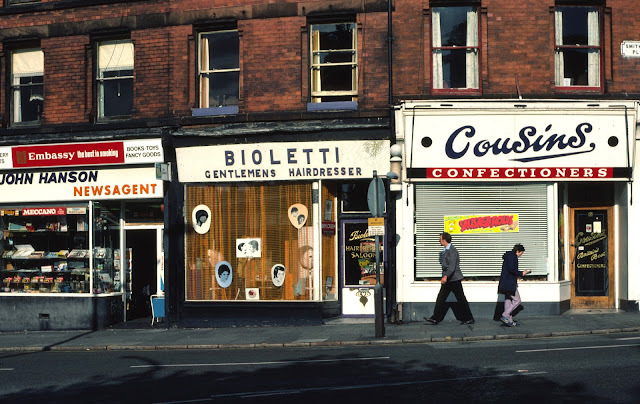 We went down to Penny Lane from College occasionally to do some shopping – usually in small groups. But I also remember once being down there by myself to do some Christmas shopping for my family – along Allerton Road. Strangely – and disappointingly - I don’t have any photographs from this five-month stay at Woolton College, even though I have a few dozen pictures from the previous year in Shropshire. I had been given my first camera for Christmas, 1967 – a Kodak Brownie, a very basic point-and-shoot, plastic camera that took 127 sheet film. The negatives were slightly bigger than 35 mm film. I had taken a few rolls of photos that previous year in Shropshire – the 127 roll came in 12 and 24 shots. You had to be very selective when photographing events back then! But I had no shots at all of Woolton College in ’68-’69. "... In Penny Lane there is a barber showing photographs, of every head he's had the pleasure to know ..."
When I came back to Liverpool for a visit in the summer of 1976, I had my beloved Nikkormat FTN camera with me. I was visiting my friend Michael, whose family lived just a few houses down from Woolton College, on Menlove Avenue. 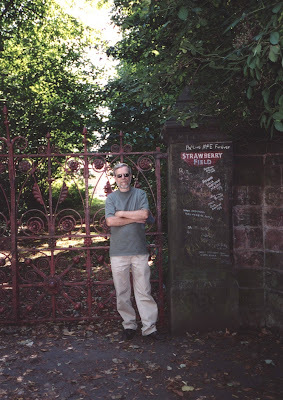 On this occasion – my second trip back there – I went down to Penny Lane with Michael to get some photographs, with those familiar Beatles’ lyrics stuck in my brain. Here are the shots I took there – Kodachrome 35 mm slides. "... On the corner is a banker with a motorcar; the little children laugh at him behind his back ... "
Penny Lane - the Beatles’ song - was written by Paul McCartney in late 1967 and recorded at Abbey Road studios in London over eight sessions in December ’66 and January ’67. It was a response to John’s earlier recording, Strawberry Fields Forever, recorded in November and December of 1966. Both songs are tributes to Liverpool. Paul and John had been planning for over a year to compose matching songs about their home city. These were the first two tracks for the new album, Sgt. Pepper, which would emerge about six months later. Their record company, EMI/Parlophone, were anxious to get another single released in the meantime - so rather than record separate songs specifically for single release, the band agreed to put out these two early tracks together. The Beatles’ policy on singles was to keep them separate from albums. So these two superb tracks were not included on Sgt. Pepper. George Martin always regretted that. Nonetheless, that did result in giving us the very best single The Beatles ever released. Paul’s song is a wry and nostalgic portrait of Penny Lane - a shopping district near his home in Allerton, and near John’s home in Woolton. 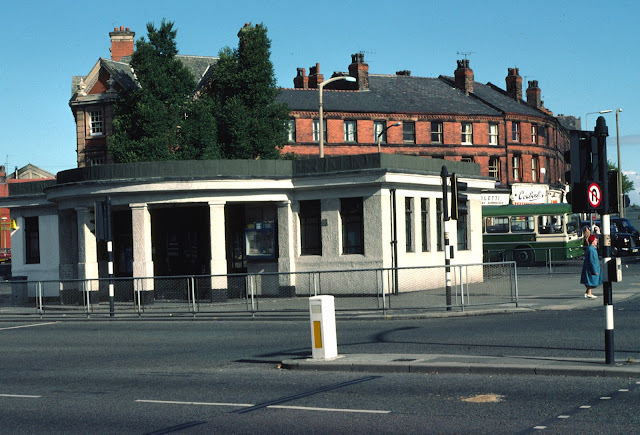 Stand at the roundabout in Penny Lane and you can see all the details: the barber’s shop, the bank, the fire station, and the “shelter at the middle of the roundabout”. 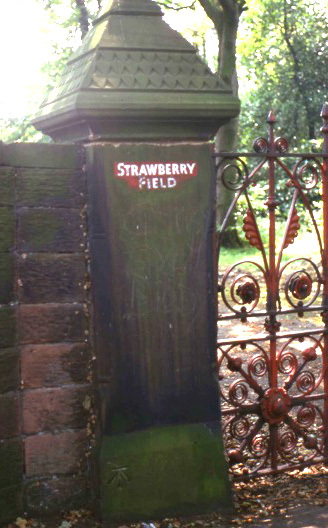 They shot a film to promote this single – as well as one for Strawberry Fields Forever, the flip side of this double A-sided single. Most of the street shots used in the Penny Lane film were actually shot in London – where most of the band now lived and worked. These films may be considered as two of the earliest “rock videos”. The Strawberry Fields Forever film is surreal and trippy. But, as usual, Paul’s contribution, Penny Lane, is sunny, upbeat, melodic and poppy. On the way back down the dual carriageway that is Menlove Avenue, Michael and I eventually turned east up Beaconsfield Road – just before reaching his parents’ place. On the northern side of the road there are several schools set back from the road – including S.F.X. 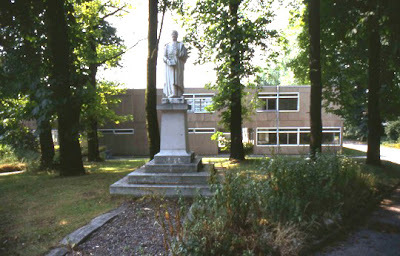 (St. Francis Xavier), the Jesuit grammar school that Michael had once attended. But we weren`t visiting his former college. We stopped only about 100 metres up. On the south side of the road (right-hand as you go up the hill) sat the entrance into the Strawberry Field Children’s Home. With my Nikkormat, I got a shot of the gates, and a shot looking down the driveway. Just two? Crazy! Those were analogue days. Expensive to buy those cartridges of 35 mm film and then have them developed as slide transparencies. Twenty-seven years later, I was back on a pilgrimage to Menlove Avenue – with two Michaels this time: the Michael who had grown up there; and another Michael, this one from Manchester, who was also a former-student at Woolton College. We stopped first at the former-home of Michael’s family. 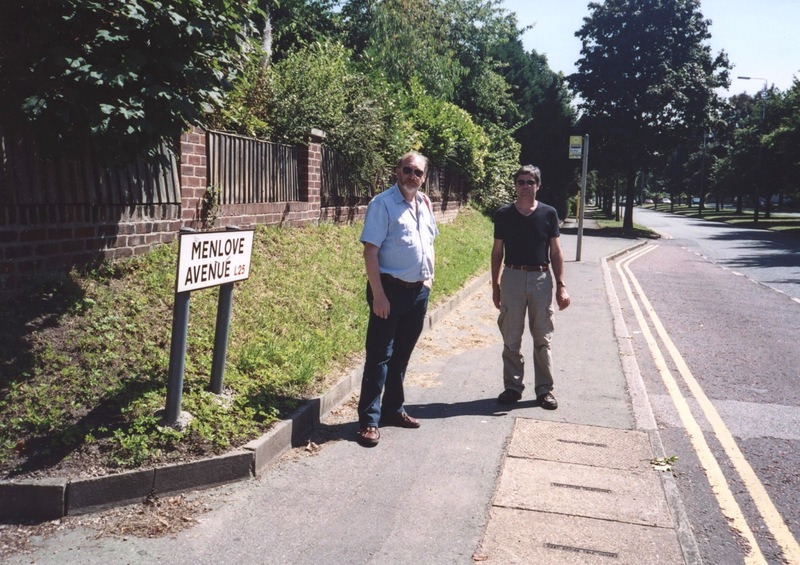 Then we crossed over to the other side of Menlove Avenue so that I could get a photo with the street name in it. This time I was using a point-and-shoot digital Olympus camera. During the 27-year gap since my previous visit to Woolton, I had read many, many books about the life and career of The Beatles – especially the fascinating accounts of their childhood development in Liverpool, and their emergence as a great performing band in Hamburg, Germany. I already knew all about Lennon’s Aunt Mimi and Uncle George. 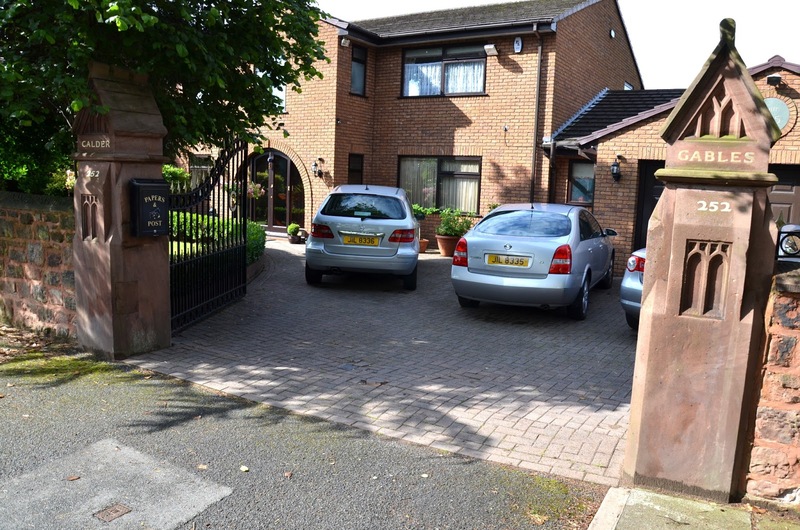 But I was shocked to discover that Mendips, the suburban home owned by Mimi and George Smith, was located at 251 Menlove Avenue – just 150 metres away – a couple of minutes walk – from where we had been at Woolton College. But the College was now long-gone. Not just the college, the building, too, was gone. The teaching brothers had closed up both schools. Not enough boys interested any more. And they took over the running of S.F.X. on Beaconsfield Road from the Jesuits. 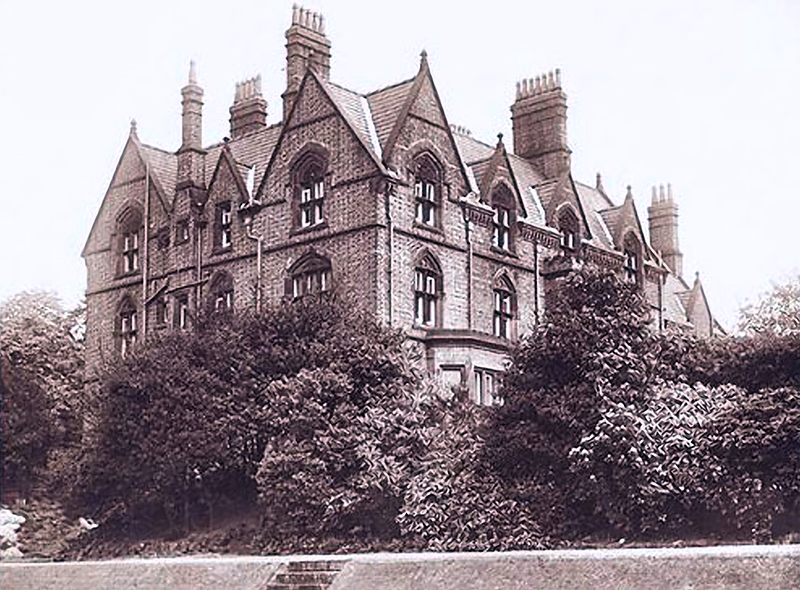 Woolton College and The Gables were sold up and demolished to make way for a small housing estate on Calders Grove. 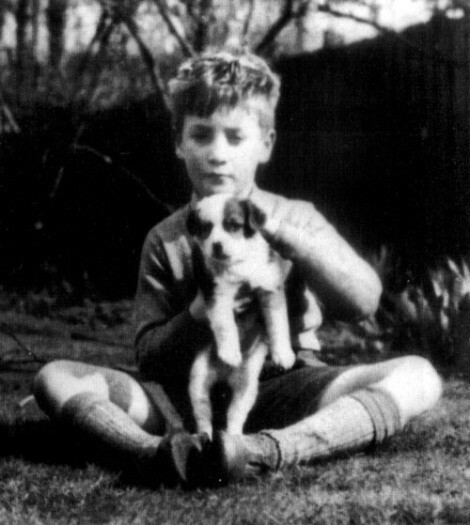 John Lennon lived at 251 Menlove Avenue from 1946 until 1963, when – as a twenty-two year old – he moved down to London. Aunt Mimi lived at Mendips until the summer of 1965 [her husband George had died there in June, 1953]. 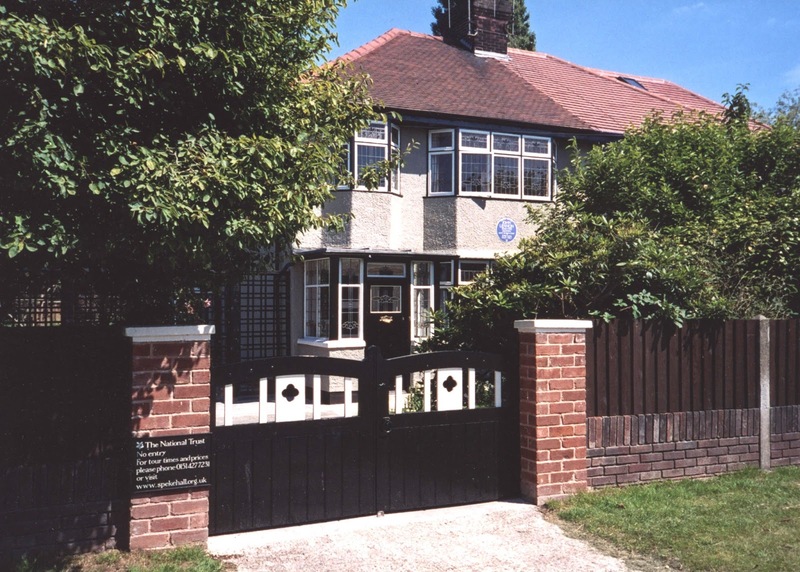 Lennon bought her a bungalow at 126 Panorama Road in Poole, Dorset. It was called Sandbanks because it was located on the Sandbanks spit, which juts out into the entrance to Poole Harbour. Mendips continued life as a private residence until 2002, when it was put up for sale on the market. 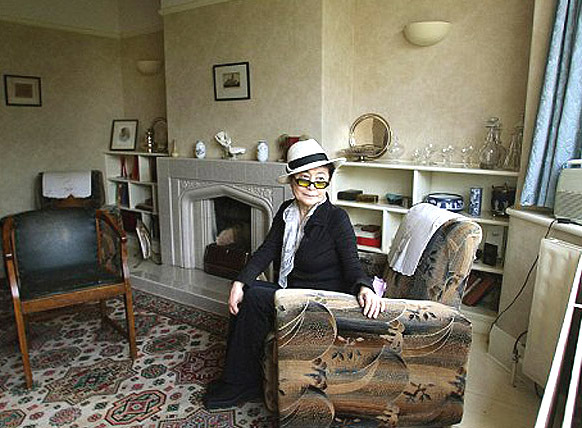 Yoko Ono bought the house for £150,000 and immediately donated it to the National Trust, with the understanding that they would restore the home to the way it would have looked in the 1950s. "When John's house came up for sale,” Yoko explained, “I wanted to preserve it for the people of Liverpool and for John Lennon and Beatles fans all over the world." The Trust opened the house to the general public on 27 March 2003. If it wasn’t for one of those familiar blue plaques attached to the front of the house, and a very modest sign on the left side of the front gate, which announces that this is a National Trust property, you would have no idea that this home was nothing more than a typical semi-detached house on a spacious middle-class boulevard in the city. 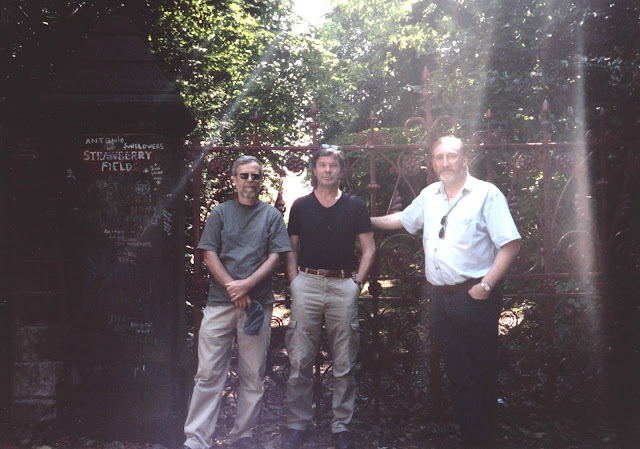 And back in ’68-’69, the three of us had no idea that this had been John Lennon’s childhood home. We got photographs of the house and various photos of individuals and groups posing in front of the gates. 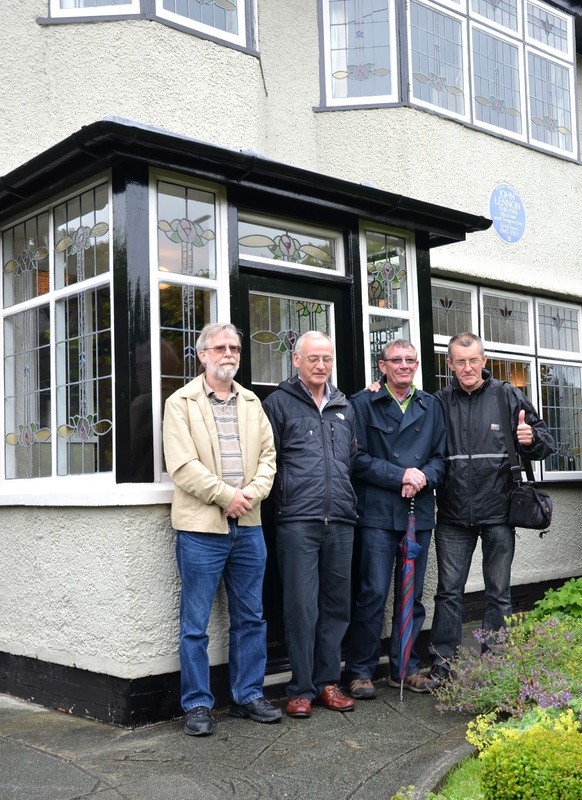 We didn’t go inside – it’s not allowed, unless you’ve paid for the official National Trust tour that brings you here by mini-van to Mendips, and then takes you on to Paul McCartney’s nearby childhood home on Forthlin Road in Allerton. Of which, there’ll be more later. After visiting Mendips Michael H., Michael B., and I walked the short distance over to Strawberry Field. You go north-west on Menlove Avenue, and then east uphill on Beaconsfield Road for about 100 metres. 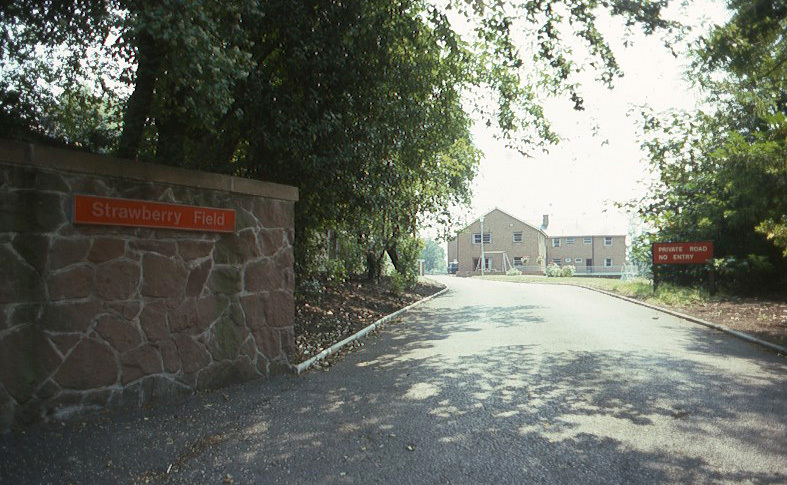 The entrance to the Strawberry Field Children’s Home is on the right. The stone and cement gate-pillars are still there and there are some red, wrought iron gates. 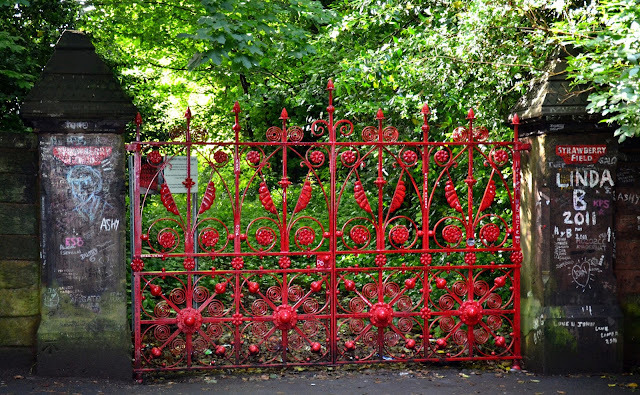 The original gates were removed in 2011 – fear of theft, perhaps – and replaced with replicas.
" ... Nothing is real; nothing to get hung about ... "
The former nineteenth-century house at Strawberry Field had been sold to the Salvation Army, and they had opened it as an institution for poor families in 1936. When Lennon was just a little nipper, Aunt Mimi used to taken him to the Home each summer, to attend the annual garden fete. When he was a bit older, John and his schoolmate chums used to explore the grounds around the place and find different ways to play there. The original house was eventually demolished and replaced by purpose-built family-units in the early 1970s. And those were closed in 2005. The site now hosts a church and prayer centre. At the conclusion of our 2003 visit to Liverpool, Michael H, Michael B and I went into the City Centre to see Mathew Street. It lies between Temple Court and North John Street and is now famous as the small side-street that once housed The Cavern Club. This area of the city is now known as the Cavern Quarter. It used to be the centre of the wholesale trade in fruit and vegetables. The Cavern had opened as a jazz club in 1957, modelled by its owner, Alan Sytner, on some jazz clubs he had seen operating in Parisian cellars. 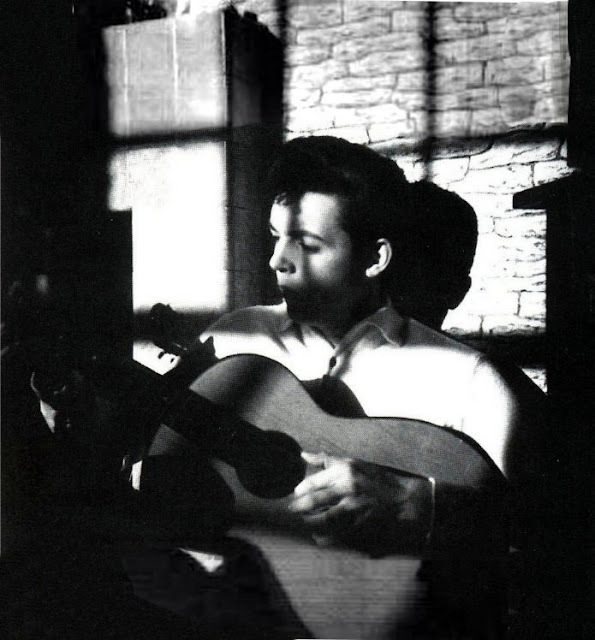 Sytner would not allow rock ‘n’ roll at The Cavern, but in August 1957 he gave Lennon’s skiffle band The Quarrymen the chance to play briefly between jazz sets. After Sytner sold the club to Ray McFall in 1959 the club slowly began to feature blues and rock bands. The Beatles made their first appearance at The Cavern on 9 February 1961. They played there 292 times between 1961 and 1963. 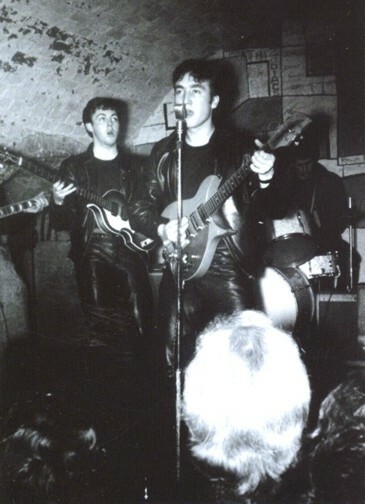 The Cavern closed in early 1973 and was filled in during the construction of an underground rail loop for Merseyrail. Later it became part of an underground parking garage. In April 1984 Tommy Smith, a former player with Liverpool Football Club, bought the Cavern site and had a new club built that was designed to look as much like the original as possible. In 1991 Bill Heckle and Dave Jones took over ownership and have been managing the club ever since. It is a very busy performance space, but much of the traffic coming into the club are the daily hordes of tourists dropping in briefly to see what this famous club was all about. Just a few doors down from The Cavern Club is a pub called The Grapes. During breaks between their sets at the Cavern, The Beatles would often drop into The Grapes for a drink. 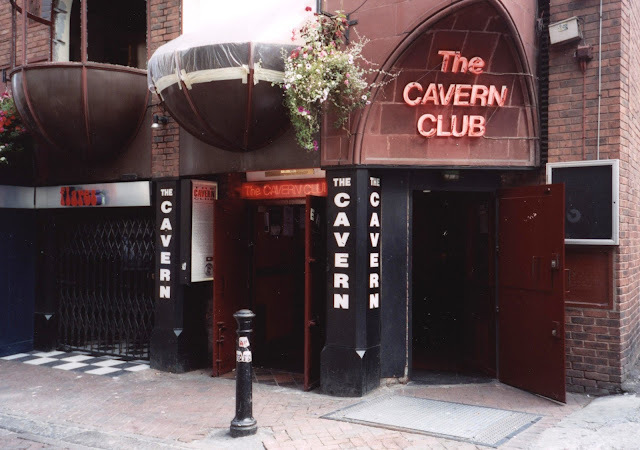 The Cavern did not serve alcoholic drinks back in those days; for a pint, your choice was either The White Star – just around the corner in Rainford Gardens – or The Grapes, the only traditional pub on Mathew Street. It served primarily a teenage crowd, the clientele from the beat-club nearby, who were looking for something more than the fizzy pop and coffee they served in The Cavern. 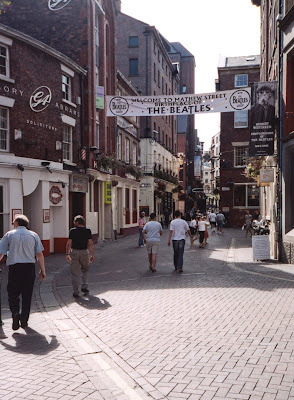 Mathew Street is now a mecca of Beatles-themed and Beatles-related enterprises. There are statues displayed up on the outside of buildings. There are boutiques and music stores. And shops stuffed with Beatles memorabilia. Some of it is tacky, but what the hell! 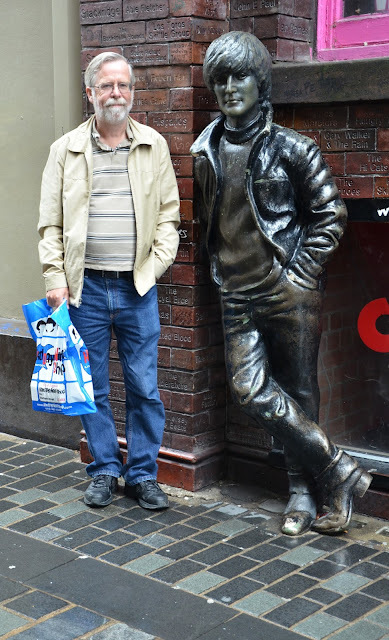 I dropped into one shop, on the corner of Mathew Street and North John Street, and bought a couple of Beatles mugs, and a set of Beatles buttons for my daughter, Gillian. 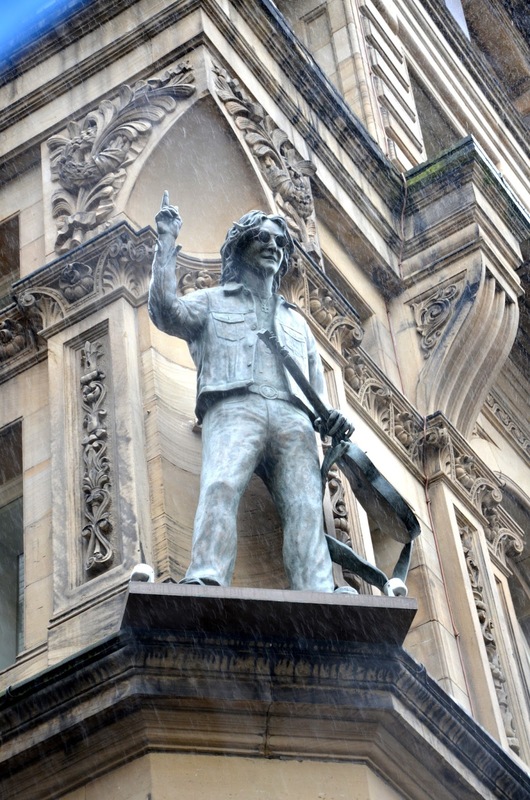 Further down Mathew Street, closer to North John Street, there is a full-sized, bronze statue of John Lennon. 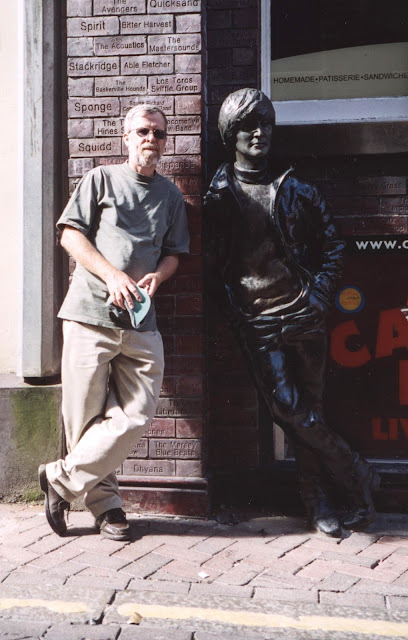 It must have been photographed hundreds of thousands of times by now – many of the photographs like mine, with Lennon fans standing beside the three-dimensional image of their idol. I was back in Liverpool last summer (13 July, 2012) for a school reunion of former students of St. Edward’s College (in Shropshire) and Woolton College (on Menlove Avenue in Liverpool). In the early afternoon, I met up with Tony, Paul and Brian at the Jurys Inn Hotel, near Liverpool’s City Centre. 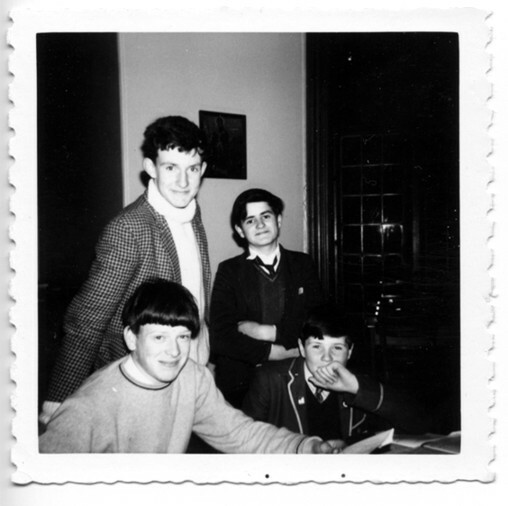 The four of us had been in the same class for two years at the boarding school in Shropshire (1966-1968). We had signed up to do the Beatles’ Childhood Homes, the official tour offered by The National Trust – and the only way that you can get inside John Lennon’s former-home at 251 Menlove Avenue in Woolton and Paul McCartney’s former-home at 20 Forthlin Road in Allerton. The tours leave by mini-bus from either the Jurys Inn Hotel – which is beside the Albert Dock, in the city centre – or from Speke Hall, in south-east Liverpool. For this latest visit I had a new camera, my Nikon D7000 – a huge advance in quality from the Olympus point-and-shoot camera I had in 2003. But in Liverpool, that day, it was overcast throughout, and it rained for most of the day. I’ve had to brighten up many of the shots using Photoshop. There were fifteen of us on this National Trust trip. We piled into the mini-van and were soon on our way. 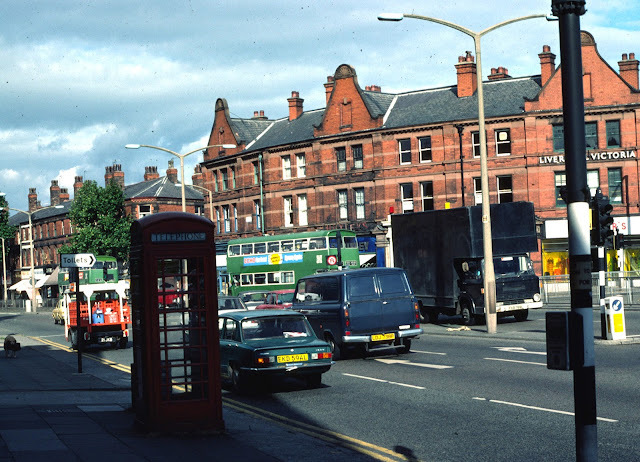 Within a few minutes we were out of the city centre and heading for Woolton – a very straight forward route: Strand Street, Upper Parliament Street, and Smithdown Road. Soon enough we were heading through Penny Lane and then onto the Menlove Avenue dual carriageway. We were met at the front of the house by Colin Hall, who lives in Mendips for seven months each year, serving as both the custodian of the property and as guide for every tour-group that comes through the place. On most days that means he hosts four groups – three leaving from Jurys Inn in the city centre, and the last one coming west from Speke Hall. Colin Hall lives at Mendips with his wife, Sylvia. Once the first group of the day arrives at 251 Menlove Avenue, Sylvia goes over to 20 Forthlin Road to prepare McCartney’s former-home for the day’s visitors – because she is the tour-guide there. 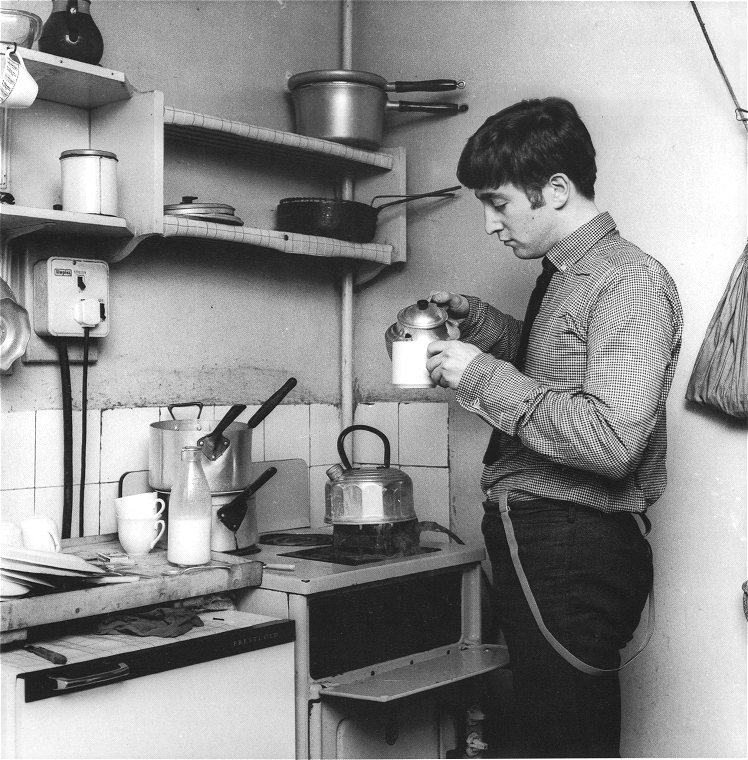 The first stop on the tour of Lennon’s former home is the kitchen. We got to it from the side of the house. Colin Hall brings all the groups in here first. As he explained, nearly all of Mimi’s visitors were required to come through the back – so as not to bring dirt and mud into the more formal area at the front of the house. We would be escorted through the front door and porch at the end of the tour. Mr. Hall began his tour of the house with an extended talk in the kitchen about the history of the house and the social conditions that Aunt Mimi, Uncle George and John Lennon lived through during the forties and fifties. 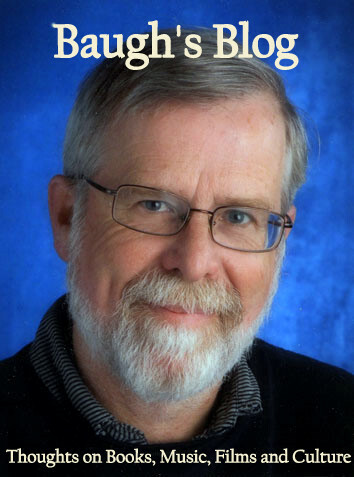 This was a fascinating talk – Mr. Hall really knows his stuff. And I began to remember much of my own experience growing up in the late fifties and early sixties down in Hampshire. They have equipped the kitchen with authentic appliances. And the shelves are stocked with jars, bottles and packets familiar to that period. 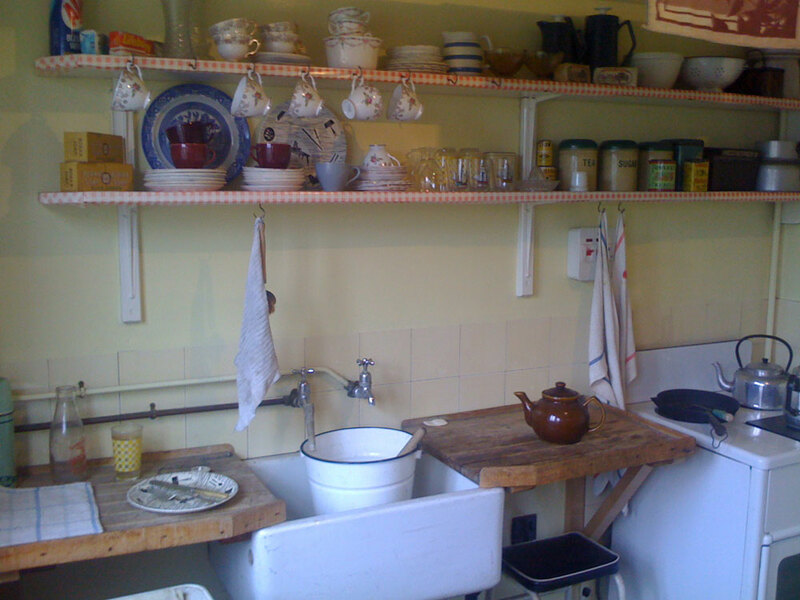 Aunt Mimi used to prepare John’s favourite meal here – egg and chips, and a large mug of tea. On the kitchen wall there is a framed copy of a poem John wrote for Mimi called “A house where there is love”. Mimi modernised the kitchen in the 1960s. She had a yellow, formica worktop put in by the window, and a sink with a double drain was installed. 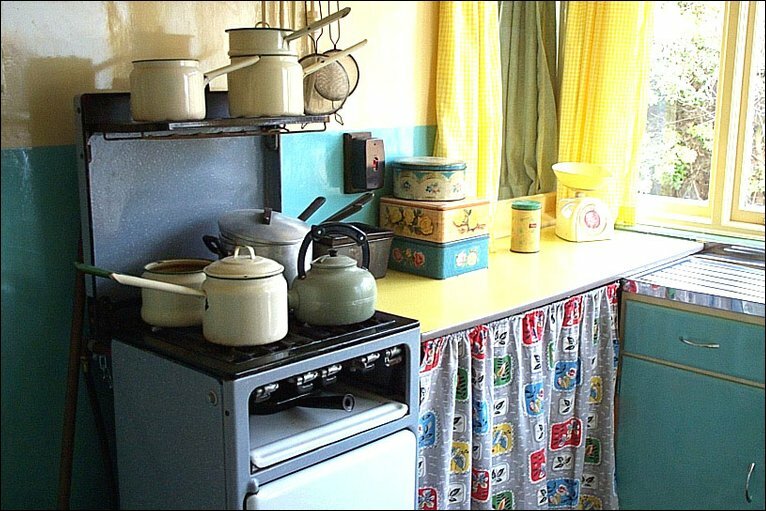 The National Trust has removed many of the later modernisations in Mendips – in order to return the house to its look in the ‘50s and early ‘60s. 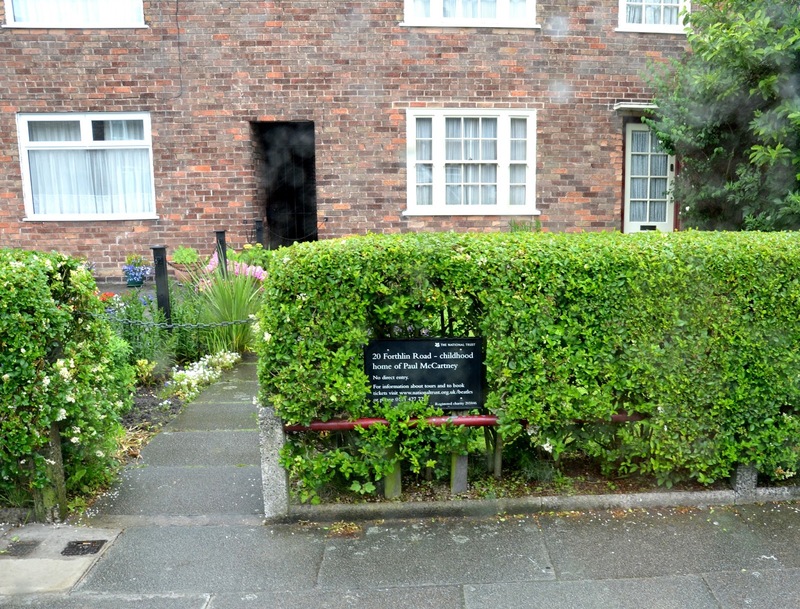 Unfortunately, photography is not allowed in either of the former-Beatles’ homes. I was anticipating this, but it was still a big disappointment. All of our cameras were collected and stored in a small cupboard under the stairs - to make absolutely sure that nobody violated the rule. So my own photos here are limited to the outside of the house; however, I did find some shots of the inside of both homes from articles posted to the ‘net by British newspapers and the BBC. Mendips was built in 1933. It’s a three-bedroom, semi-detached house located at 251 Menlove Avenue, near the corner with Vale Road, in the Liverpool suburb of Woolton. The residences down Menlove Avenue are detached and semi-detached houses - built with similar plans, although the builders offered opportunities to personalize each house by using various, optional trimmings. This would give the development a little bit of variety. Many of the windows at Mendips, for example, had art nouveau-styled stained glass features added, and an art deco fireplace in one of the rooms. Mimi and George Smith bought Mendips in 1942. In the thirties it became a common dream of working-class and lower middle-class families to live in a house like those in the Menlove Avenue development. Hundreds of thousands of houses, just like the ones on Menlove Avenue, were built throughout the 1930s on the edges of English towns and cities, creating middle-class suburbia. The ground floor of Mimi and George’s house had a staircase and entrance hall that ran beside the front lounge, or “parlour”. The hall led back to a dining room, morning room, and kitchen. 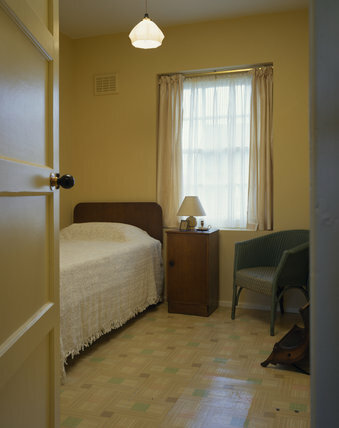 Upstairs, on the first floor, there were two large bedrooms and one small bedroom spread around the stairwell. At the back of the upper level were a bathroom and a separate toilet. 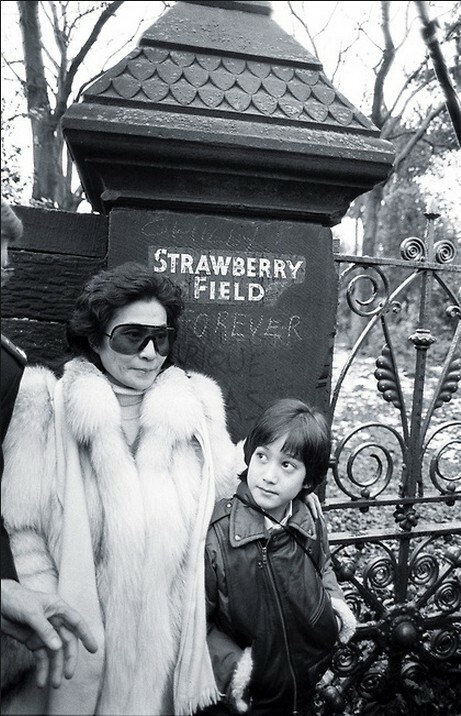 Yoko Ono bought Mendips in 2002 and donated it to The National Trust. Here she visits the house after it has been made ready to receive visitors. After the kitchen, the front lounge, or living room, is the most interesting room downstairs. The original Art Deco styled open fire was replaced, after John left Liverpool, by the tiled fireplace that had once been in the back dining room. Built-in bookshelves were added on either side of the fireplace. 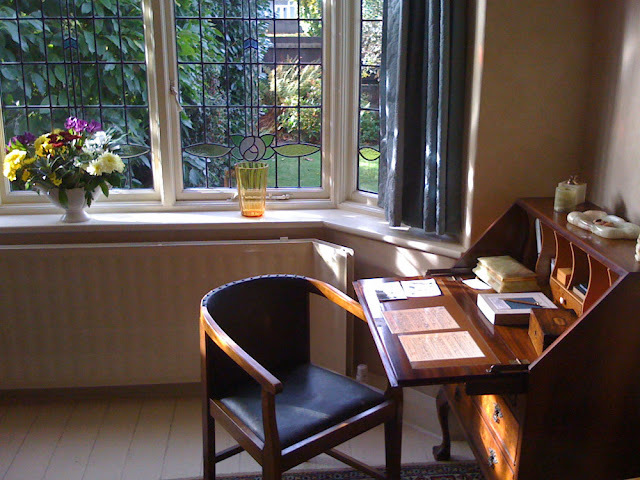 John was always writing poems and songs in this room. During the colder seasons the room would have been warm and cosy because of the fire. He would be working on something – often screwing it up in frustration and tossing it away. “You ought to pick these up, Mimi,” he would joke, “because I’m going to be famous one day, and they’ll be worth something.” How right he was! One of Mimi’s famous retorts to John, when she was annoyed with him wasting his time banging away on his instrument and working on songs: "The guitar's all very well, John – but you'll never make a living out of it". The small bedroom upstairs was John’s. When he was a young boy it was tidy – and dominated by a giant teddy bear. As he got older, it became more untidy. He told Mimi to stay out of the room – telling her that he would take care of it. It was his special place. Where he could retreat to and dream. “There’s a place,” he sang in one of his songs, “where I can go, when I feel low, when I feel blue.” This is where he read his favourite authors, like Richmal Crompton (the William stories) and Lewis Carol. And began his first attempts to write and sketch. A private place to think and dream. Posters of Elvis, Brigitte Bardot, Rita Hayworth, and others were pinned to the walls and ceiling. John would often sit in here for hours – happily daydreaming, or doing drawings with colouring pencils, or listening to his favourite BBC radio programs, like The Goon Show, which were piped into his room on an external speaker that was connected by wire to the family radio set up downstairs in the morning room. Colin Hall remembers the day Bob Dylan showed up, unannounced, on one of the tours. He recognised Dylan immediately, but noticed that none of the other people on that tour realised who they were with. Colin remembers the incredible moment it was when he stood inside John’s bedroom with Dylan sharing a few quiet words. At one time the National Trust only had ownership of Paul McCartney’s childhood home at 20 Forthlin Road. When the notion of getting Lennon’s home as well was muted, some of the Trust said that it would not be of as much interest because Lennon didn’t write any songs at Mendips. While it is true that John and Paul did most of their early song writing collaborations at Paul’s house, they did practise and work on songs in Mimi’s house. When Mimi felt the “noise” was getting to be too much, she would banish the duo, with their guitars, to the front porch – which they didn’t mind because the acoustics in there added an impressive reverb to their playing and singing. This enclosed porch wasn’t an original feature of the house – George and Mimi had it built in 1952. 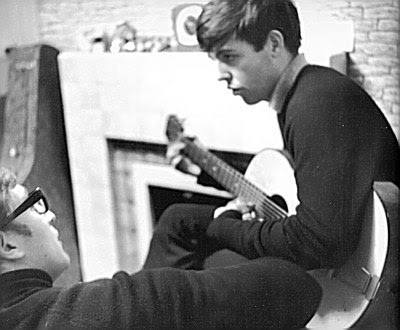 John played in it often – using the £17 guitar that Mimi had bought for him. Paul remembered Mendips as being “posh”. Mimi treated him well, because he was clearly the politest and most personable of John’s young friends. 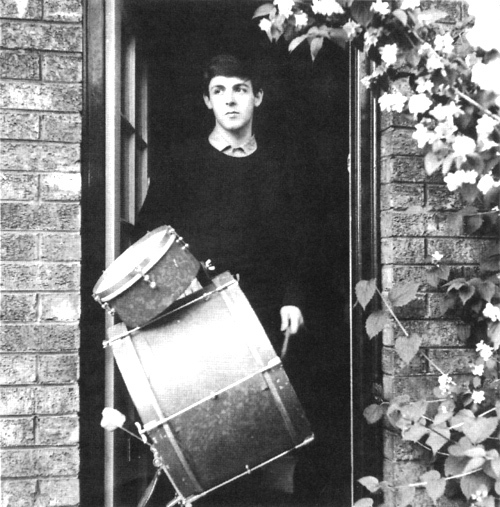 But when they sensed that the music-making had outstayed its welcome, they would hop on their bikes and cycle over to Paul’s house nearby – which is where we were headed after a brief examination of the front porch and some final lingering moments in the front garden of Mendips. 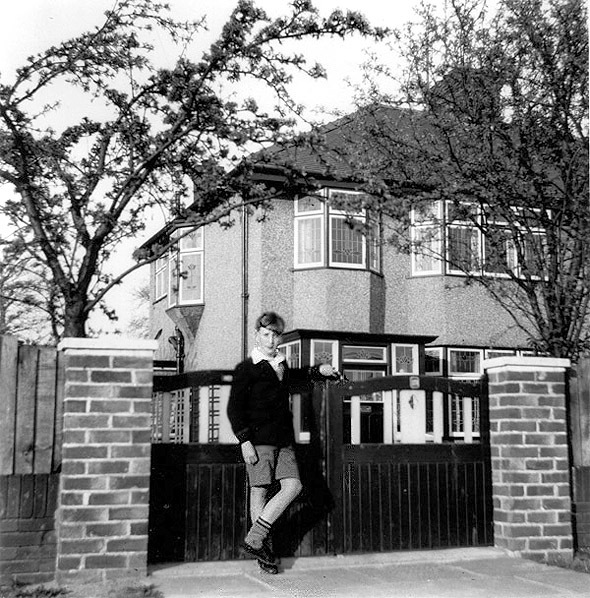 To get to the McCartney’s former home in Allerton – at 20 Forthlin Road – back in the mid-‘50s, you only had to walk about 150 metres south on Menlove Avenue and then cut west across the Allerton Park Golf Course until you reached Mather Avenue. Then it was about 100 metres north on Mather Avenue; and Forthlin Road was the first street left. By bicycle they probably would have gone north on Menlove Avenue and then pedalled west via Yewtree Road and Booker Avenue. Sylvia Hall, the guide at 20 Forthlin Rd. 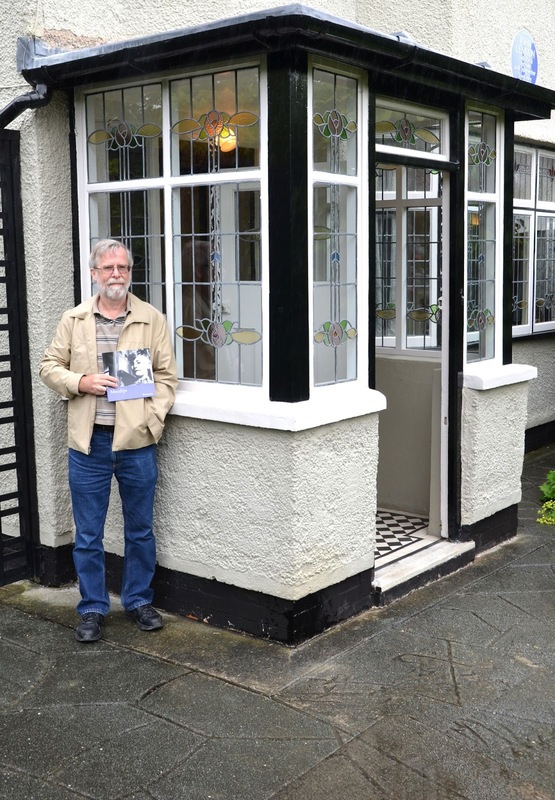 As I mentioned earlier, the tour of the former McCartney home was conducted by Sylvia Hall, the wife of Colin Hall, who guides the tours around Lennon’s home on Menlove Avenue. Colin and Sylvia Hall live for seven months of the year at Mendips. Sylvia comes over to Forthlin Road in the late morning to prepare for that day’s visitors. 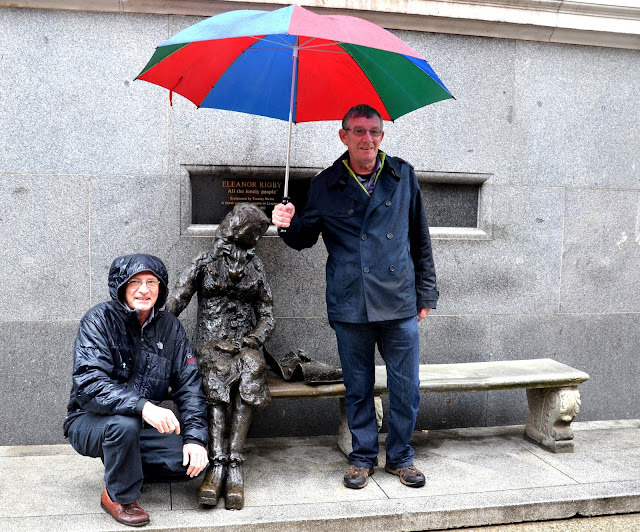 On the day we were in Liverpool (13 July 2012), it rained pretty much for the whole day. 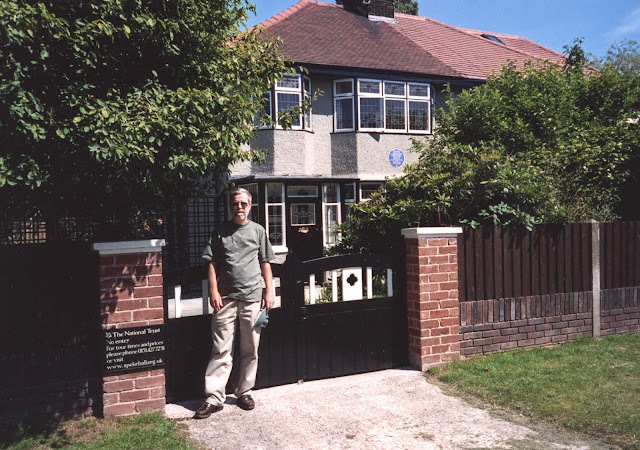 Not so bad when we were inside at the two Beatles’ homes, but a drag when we were walking around Liverpool city centre. The rule about no photographs inside Lennon’s home also applied here at Forthlin Road. We had to put all our cameras on a table under the staircase. So the only photos which are mine here are the ones taken outside the front of the house. There are pictures here taken by Mike McCartney, Paul’s brother. And I found some photographs that show scenes inside the home. The McCartneys moved into the house at 20 Forthlin Road in 1955. When Paul’s parents, James (“Jim”) McCartney and Mary Mohin, got married they lived further north, closer to the city centre. After the war they planned to seek a better standard of living by moving into one of the new council estates. Liverpool had been very heavily bombed during the war and two-thirds of the city’s residential housing had been destroyed. Much of the population moved from inner-city tenements to suburbs being developed on the outskirts of the city. Jim and Mary McCartney chose Speke, which was 9 miles south from their former home. Eventually Mary became keen to find a nicer council estate closer to the city. 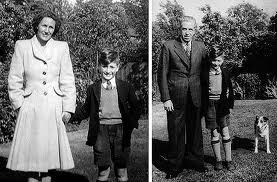 In 1955 they found what they were looking for, and moved into Allerton, four miles north of Speke. 20 Forthlin Road was part of the Mather Avenue estate – a development of some 330 houses built by the council between 1949 and 1952 on land bought from the Police Training College. The McCartney home was a two-storey, mid-terrace house. It was built by Costains for £1,369 9s 1d, from a 1947 design by the Liverpudlian architect Sir Lancelot Keay. It was quite a simple design. To the left of the entrance hall, you walked into the living room (or “parlour”). From there double doors led into the dining room at the back. And that room connected to the kitchen and then the hall. Paul liked the straightforward, cozy set-up so much that he copied it when he came to design his own home later in life. Upstairs at Forthlin Road, there are three bedrooms, a bathroom, and a separate indoor toilet. Their house at Speke didn’t have an indoor “loo”. Their new situation seemed quite luxurious – no more freezing cold toilet seat in the outhouse on a frigid winter morning! Another special feature of their house – for that time – was a telephone. It was necessary because of Mary’s job; she worked as a midwife and health visitor, so she needed the telephone to be called in during emergencies. And, like many other Britons, the McCartneys bought a new TV in 1953, in order to watch the coronation of Queen Elizabeth. When they first moved in the living room walls were painted cream-white. They almost immediately decorated the walls with wallpaper. Paul, and his brother Mike, chose the patterns – strangely, a different pattern for each wall! 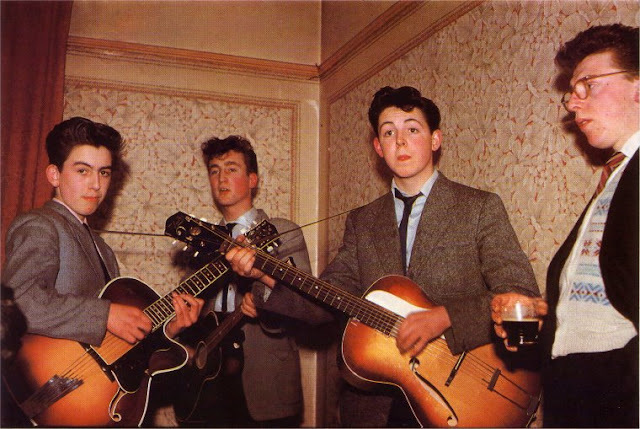 The McCartney home was a musical place. 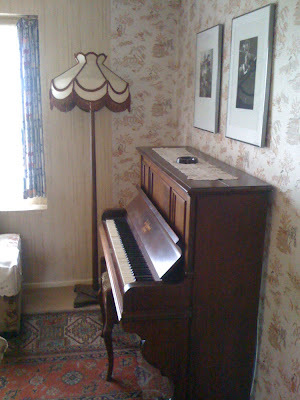 In the corner of the living room is an upright piano, which Jim would play. He bought it from Harry Epstein at NEMS on Walton Street in the city. NEMS stood for North End Music Store. And Harry Epstein was the father of Brian – The Beatles future manager. Jim McCartney was a former musician, and in the 20s had led his own group – the Jim Mac Band. When Jim recognised that Paul had musical talent, he sent his son to take piano lessons. Paul quickly rebelled against the formality of the sessions – preferring to pick out tunes by himself, in the privacy of his own living room. Paul’s father also rigged up extension cables and headphones for his two sons so they could listen to Radio Luxembourg in the evening, in order to hear the latest R&B and rock ‘n’ roll records coming out of the U.S. He ran wire from the radio set in the living room to their bedrooms. Paul and Mike would listen to the likes of Elvis, Little Richard, Chuck Berry, and Fats Domino. 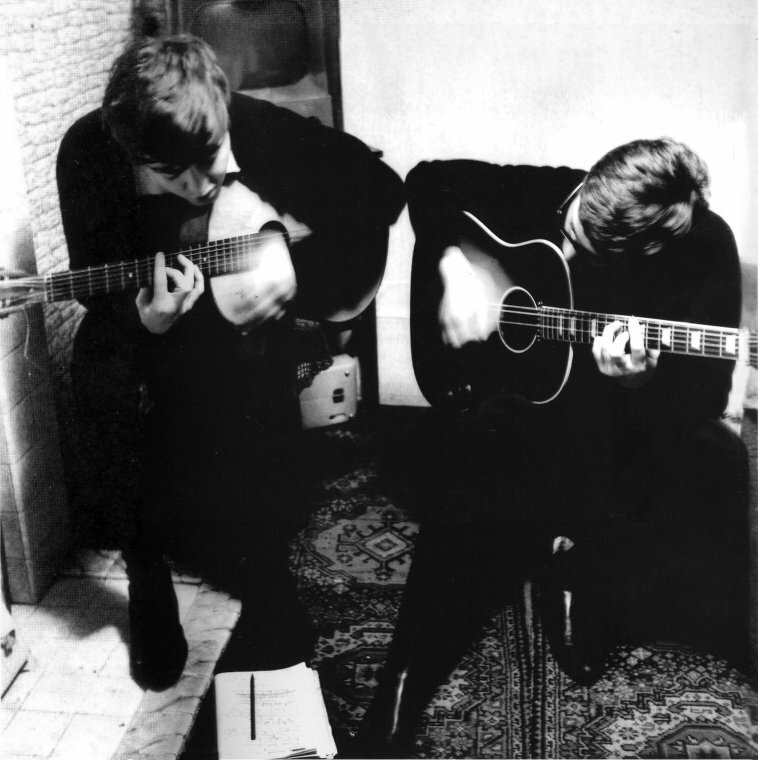 It was in the living room at 20 Forthlin Road that Paul and John would sit with their guitars and forge their song-writing partnership. Paul’s father was now a widower – his wife Mary had died quite suddenly in late 1956 of breast cancer, only a year after they’d moved to Allerton. Jim was left to bring up two sons on £8 per week. So the house was empty every weekday after Jim had gone off to work. Because of that, Paul and John would skip school – they called it “sagging off”. Paul was attending grammar school at the Liverpool Institute, in the city; and John had started at the Liverpool College of Art. The two aspiring songwriters would work in the living room for two or three hours in the afternoon. They would sit opposite each other, slumped over their guitars, as they tried to read the words and chords of the song they had written into an exercise book that lay on the floor beneath them. Paul had “borrowed” the note book from the Liverpool Institute. Each song copied into the book came under the headline “A Lennon-McCartney Original”. Their unwritten rule was this – if they didn’t remember, on the next day, much of the song that they had been working on during their previous session, they would discard it and begin another. Two early Beatles’ songs that were written in this living room were “Love Me Do” and “I Saw Her Standing There”. “Love Me Do” became their first single, released in October 1962. 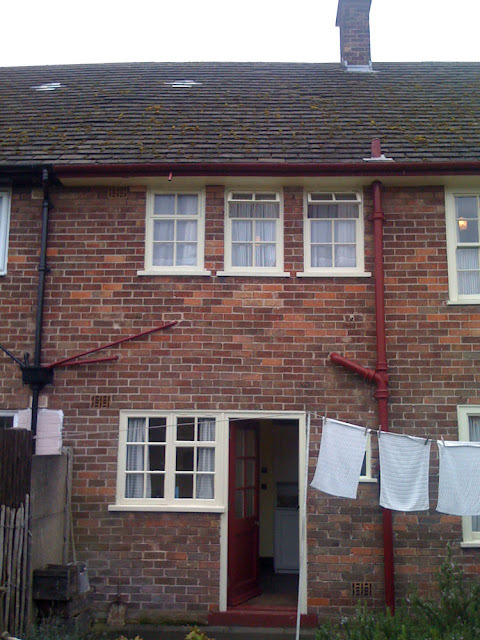 The kitchen door at 20 Forthlin Road leads into a back garden, which still contains the original coal shed and outdoor toilet. Paul remembers sitting on the roof of the shed in order to watch the annual show at the Police Training College, in the large field next to their terrace. Jim was a keen gardener and planted shrubs and flower beds. The back of 20 Forthlin Road - photo by Joe "Pepperland"
Mike McCartney, Paul’s younger brother, developed into a keen and talented photographer. He was essentially self-taught; and some of his experiments involved shots of his brother and his musician friends. Many of these photos were posed, or taken candidly, in the back garden. On the walls throughout the house, there are large, framed copies of many of Mike McCartney’s best photographs taken inside and outside the home. That is certainly a legitimate reason for the no-photography rule in this location. Those pictures are a highlight of the tour here – seeing the young Beatles playing together, or just fooling around. Eventually the hordes of fans who regularly began visiting the street became too much for Paul’s father. 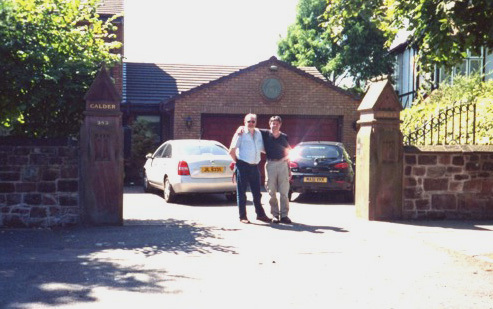 So Paul bought a large Edwardian house for Jim – located in Heswall on the south-west side of the Wirral. The house at 20 Forthlin Road passed into the possession of the Jones family, who lived there for 30 years. In 1981 they bought it from the Liverpool council under Margaret Thatcher’s “right-to-buy” scheme. 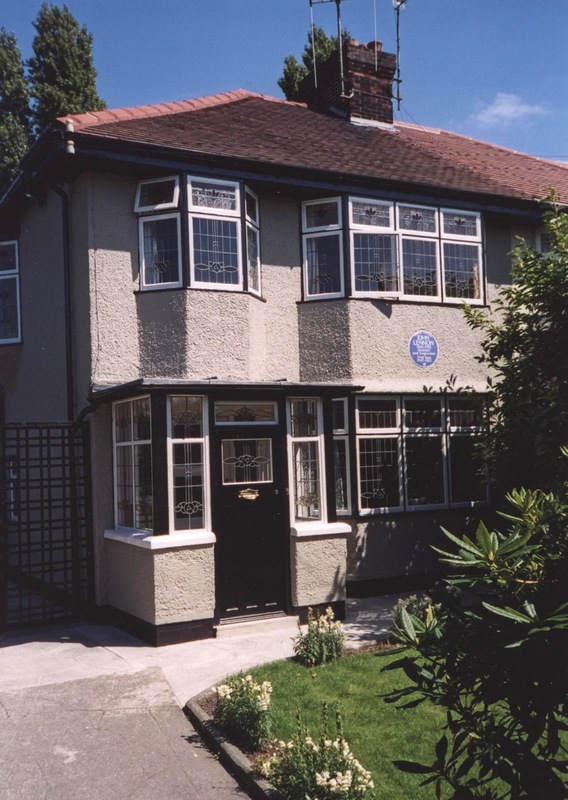 The house continued to be a place of pilgrimage for ardent Beatles’ fans. 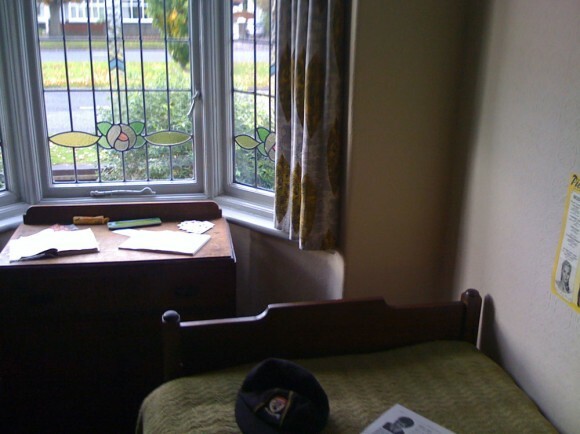 Mrs. Jones used to give a snippet of the old net curtains the McCartney’s had used to visiting fans. In 1995 the house came up for sale. John Birt, then the Director-General of the BBC, and a contemporary of The Beatles, found out about it, and approached The National Trust, suggesting they ought to acquire the house and turn it into a Beatles museum. The Trust agreed and bought the property that same year. With the assistance of the Heritage Lottery Fund, the National Trust “renovated” the house – which meant removing all the changes and modernisations that had occurred since the early ‘60s. 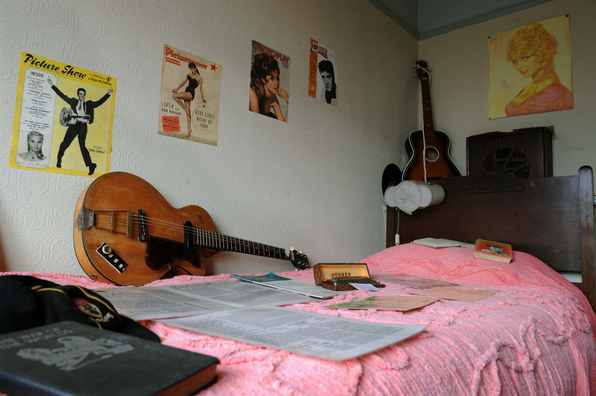 And, in addition to the Mike McCartney photographs, the home features many items of Beatles memorabilia loaned by Beatles’ biographer Hunter Davies. So that’s it for the two former childhood homes of John Lennon and Paul McCartney. But we’re not quite done yet! We’re going to go down to the city centre. My schoolmate Paul gave us a tour there, including, of course, a stroll down Mathew Street. The National Trust van took everyone back to the Jurys Inn, near the Albert Dock. 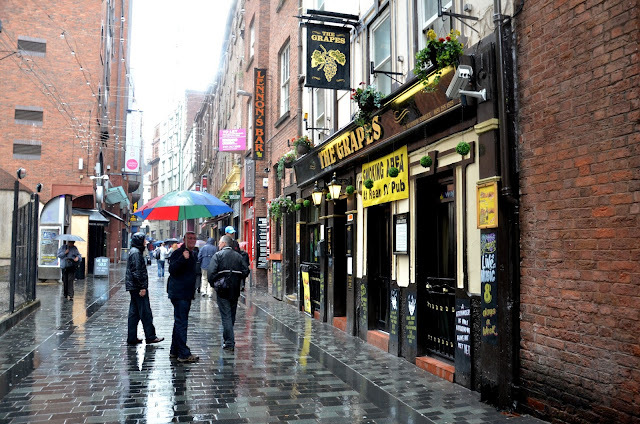 From there we walked over in the rain towards Mathew Street. Well here I am again – back in Liverpool city centre. But this is something new. This statue was sculpted by Tommy Steele and donated to the city as a tribute to The Beatles. It was cast in 1982. 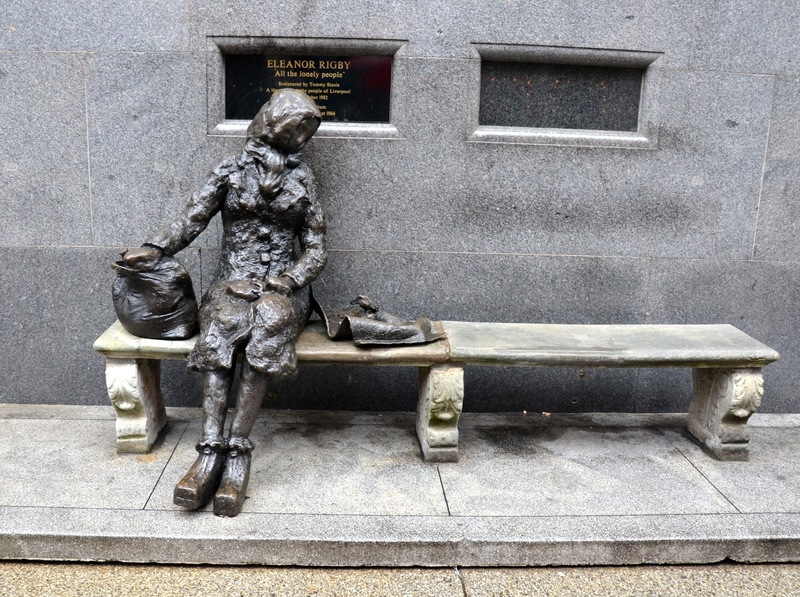 The plaque says that the statue is dedicated to “all the lonely people”. Located on Stanley Street. This is one of those statues that just invites people to pose and be photographed. The juxtaposition of cold, hard bronze and colourful, animated people makes for an interesting combination. 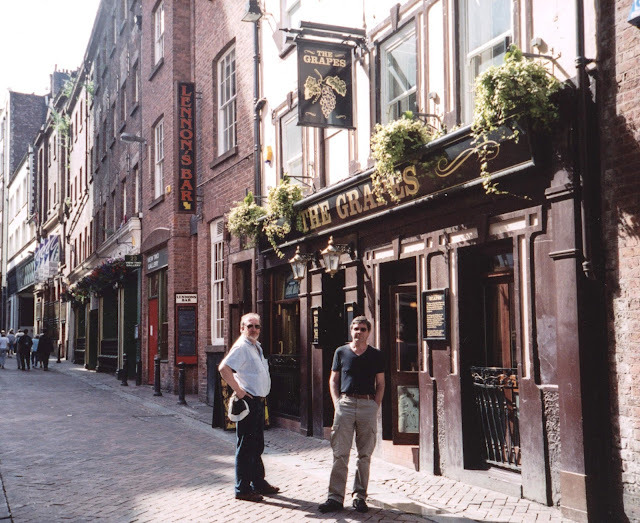 The Grapes Pub on Mathew Street. 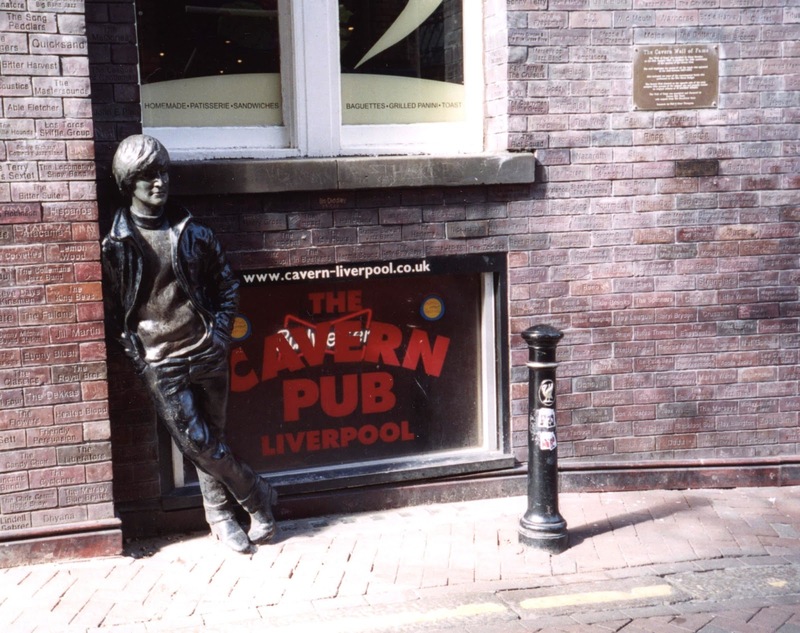 Close by the Cavern Club. The Beatles often popped over here for a drink in between sets. Grapes in the rain. The rebuilt and restored Cavern Club on Mathew Street. It is a combination of Beatles museum and performance space. It’s mostly Beatles music during the day, when most of the Beatles’ fans/tourists drop by for a short visit. There are lots of posters and memorabilia displayed on the walls and in secure cabinets. Just around the corner from Mathew Street, on North John Street, look up. There are individual statues of the four Beatles adorning the upper level of the Hard Day’s Night Hotel, a Beatles-themed four-star hotel. We stopped in there for lunch. Some wonderful posters and art-work all over the walls here. Good to get out of the rain for a while and enjoy a bite to eat and a pint. Me and John again. This statue is on Mathew Street. I’m rather wet here. “When the rain comes,” John famously sang, “they run and hide their heads, they might as well be dead, when the rain comes …”. But not us. We kept strolling around despite the weather. 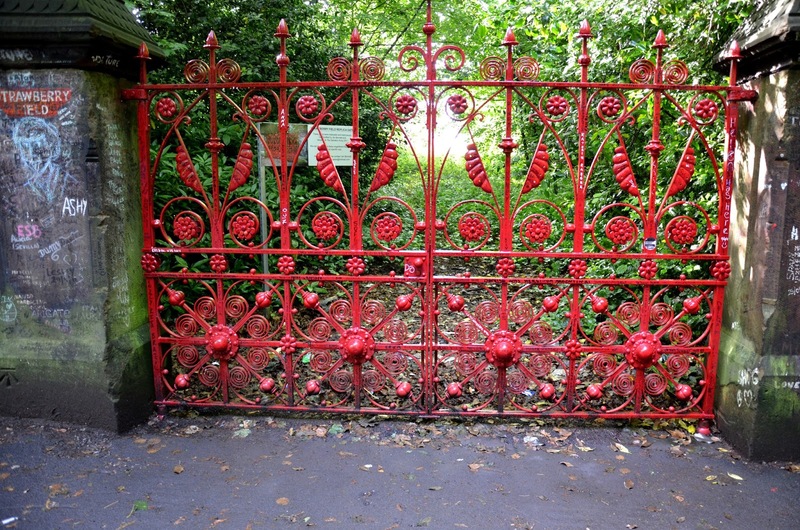 The next morning, shortly before heading east out of Liverpool towards the Yorkshire Dales, Tony and I stopped on our way down Beaconsfield Road for five minutes – we had been staying at St. Francis Xavier College – to get some pictures of the gates at Strawberry Field. The original wrought-iron gates have been replaced – fear of theft, perhaps – by replicas. John wrote Strawberry Fields Forever in September, 1966 when he was doing on-location filming in Almeria, Spain for Richard Lester’s anti-war film How I Won the War. John started wearing “granny glasses” during the filming. He had brought with him an acoustic guitar. He wrote this song, in between takes, as he was portraying a character in the film called Musketeer Gripweed. The song, despite the Liverpool reference, is really all about his LSD experiences. It’s a lyric full of self-doubt, questioning, and problems of identity. Ostensibly focused around memories of his childhood exploration of the Strawberry Field grounds near Mendips, this song is really about the disorienting effects of Lennon’s constant use of LSD. What is real? What is the dream? Who am I? And where do I fit in? 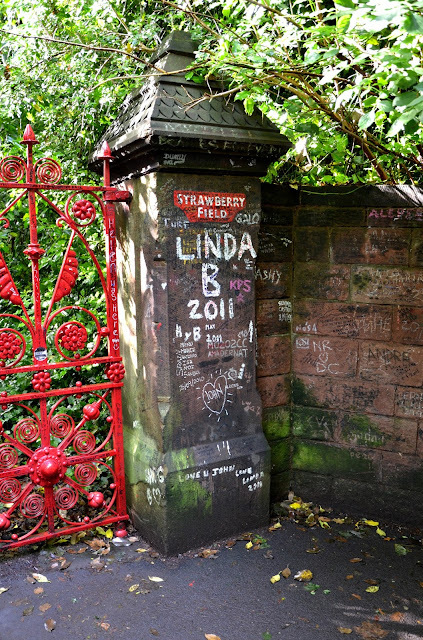 Strawberry Fields Forever took an unprecedented fifty-five hours of studio time to produce. The first version was primarily a band performance, featuring Paul on mellotron. Lennon then asked George Martin, their producer, to write an orchestrated version, which he did – an orchestration dominated by a trumpet trio and a cello quartet. Lennon then famously asked Martin to combine the two versions – starting with the band for the first minute of the track, and then blending in the orchestrated parts for the rest of the track. It was a difficult thing to do technically, but Martin pulled it off. The result is one of the band’s greatest achievements. And then back to where it all started. We went a short distance down Menlove Avenue and parked the car near where Woolton College used to be. We got out and walked over to the place where The Gables used to be – St. Joseph’s Prep School. And where they built beside it Woolton College. It lasted less than ten years as a school – and then the building was demolished. The Gables was demolished, too. Both gone. My time on Menlove Avenue back in 1968-1969 was so short. But the impact was tremendous. Some are dead and some are living – in my life I've loved them all. Clive, I came over from Tony's blog about Marmite. Being a lifelong Beatlemaniac, I thoroughly enjoyed this post. It feels as if I've actually been there myself! Jean, thanks for your kind words! Absolutely wonderful post - thanks so much. No public figures have meant so much to me as John and George. Through your post I've been on a trip to where it all began. Thanks, Mark, for your response. John Lennon was hugely influential on me, too - my favourite Beatle. 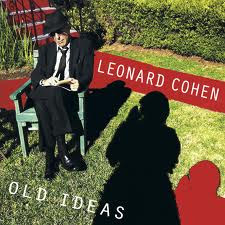 What an incredible song writer, and so witty! If you're ever in Liverpool, do the National Trust tour. Regards. As someone who attended St Josephs Prep between 67-73 and who's grandparents lived at 240 Mather ave, round the corner from Paul's house, I can identify with all the comments and pics. I still live in Liverpool and go past these places most weeks. Many thanks for puuting St Josephs on the map. It was great to see pics of the old school building which now would have been protected as a fine piece of architecture worth preserving. I hope there is more out there that people can post. Paul ( A St Joseph's old boy). Thanks for your response. Sad to find The Gables gone from Menlove Avenue! who was not only a fine muscian but for someone who stood for peace and social justice. I sincerely hope that I will eventually get the opportunity to visit Liverpool one fine future day - It would mean the world to me to see and stand in a place where once one of the greatest humanitarians of the twentieth century lived and worked. God Bless Jonh Lennon - We STILL Love & Miss You ! Thanks for your response and kind words. Glad you liked it. I was amazed to find pictures of both St Josephs and Woolton college. I attended both schools. I also went on camping trip to Market Drayton. Its a real shame that these building have gone (except prefab Woolton College). I started in very first class at Woolton College. I can not remember Clive. I love this post! 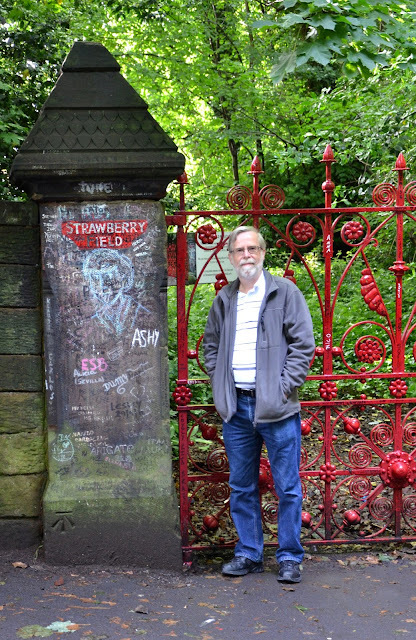 I made my Liverpool Beatles Pilgrimage in March of this year and have been trying to write down my experience before forgetting any of the details. I'm so impressed with the level of detail you shared here. I appreciate the curation of photos here, especially the inside photos of Mendips and Forthlin. The no-cameras rule makes sense, and I was expecting it, but like you, it did sadden me! 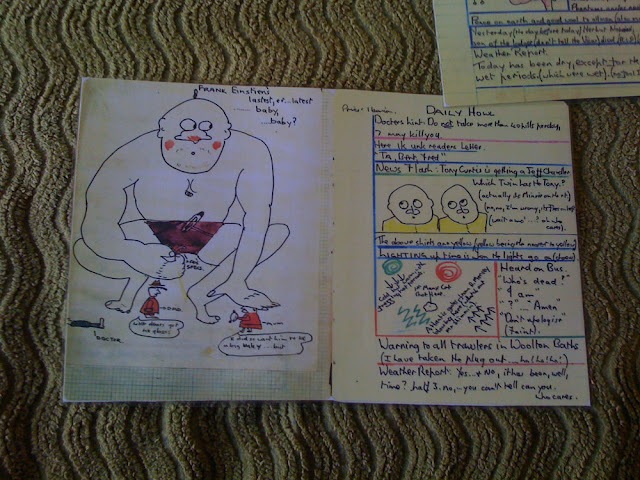 Glad to see there are at least a few photos floating around the internet that show the insides. 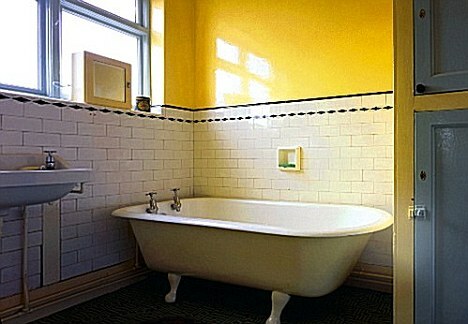 Did Sylvia mention in your tour the reason behind the mismatched wallpaper and carpets in the McCartney home? She told us that the family purchased the ends of rolls of wallpaper, because it was cheap, but they didn't find enough of any one matching paper to do the whole room. Same for the carpet, which is a collection of cheaper runner rugs sewn together to make one big carpet. Did they have the bicycle at Mendips when you toured? It isn't present in the photo of the driveway but when I went, they had the same type of bike that John owned as a boy. It seemed like Sylvia and Colin are constantly making small modifications to create a more immersive, accurate experience with these houses. Such great tours! Thanks again for the fab post. Much appreciated!